Should You Buy Intel This Week Into Earnings? Intel has a $50 price target from Nomura, who upgraded the stock ahead of this week's earnings report. Time to buy? Shares of Intel (INTC - Get Report) are up 1.8% to $44.85 in Monday's trading session. The stock is enjoying a broad rally in the tech sector, but it's also getting a little love from the analysts. Specifically, analysts at Nomura Instinet upgraded the stock to buy from neutral and assigned a $50 price target. The firm's price target represents about 13% upside from current levels. It's worth pointing out that the price target is still significantly below Intel's 52-week high of $57.60. Intel will remain "supply constrained" until it begins delivering its 10nm chips in significant volume, the analyst says. In fact, Intel has struggled quite a bit with its new chips, as TheStreet's technology guru Eric Jhonsa has reported on its production issues several times. As Nomura analysts suggest, Intel has seen a shortage of CPUs. Even though Advanced Micro Devices (AMD - Get Report) is gaining in market share, Intel is still the leader by a wide margin. Lastly, Nomura says its earnings estimates are above consensus, but are still relatively conservative in their view. Currently, Wall Street expects Intel to earn $4.16 per share this year on sales of $69.54 billion. If achieved, that will represent year-over-year growth of 20.2% and 10.8%, respectively. However, those growth figures are forecast to slow considerably for Intel in fiscal 2019. Analysts expect earnings growth of just 2.4% on sales growth of 3%. Worth acknowledging is that Intel has been branching out in recent years. It's been working on more Internet of Things solutions, autonomous capabilities and high-performance chips. It acquired Mobileye for roughly $15 billion, an acquisition that helped it land a deal to supply autonomous driving chips to 8 million vehicles from an undisclosed European automaker in 2021. More recently, Rolls Royce tapped Intel to help power its autonomous ambitions. So Intel is certainly making moves to diversify away from its legacy business. That's not unlike what Nvidia (NVDA - Get Report) has also done. Should it start to accelerate its growth, perhaps Intel will earn a higher valuation from investors, as shares currently trade at less than 11 times this year's earnings estimates. Nvidia has been a long-time holding in Jim Cramer's Action Alerts PLUS member club, but was sold before the latest decline. Now, it's back in the bullpen. Want to be alerted before Jim Cramer buys NVDA again? Learn more now. The charts haven't been too kind to Intel stock, which is down 22% so far in the second half of 2018. A look at the chart above shows how the 20-day and 50-day moving averages have kept pressure on Intel during that stretch. Most of the rallies in Intel are sold into near these moving averages, leaving the stock in a steady downtrend lower. Lately this $44 level has been buoying the name, but with the broader market under pressure this month, those lows may not hold. Its one potential saving grace? Earnings, which are due up after the close on Thursday. If the results are good, it could propel Intel up over $47. This would put Intel above the 20-day and 50-day moving averages, as well as downtrend resistance. If it can close above this mark, it will set up a retest of the 200-day, which is currently just above $49, and put Intel close to Nomura's price target. However, if Intel pulls back, it could find plenty of support down in the $41 to $42 area. 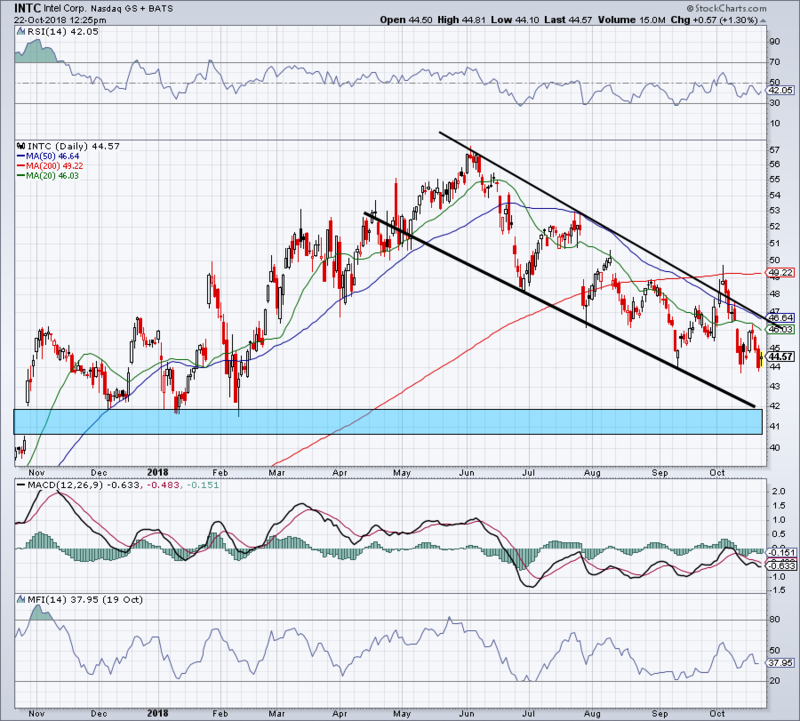 Near $42, Intel would run into a big-time prior support level, as we as the bottom of downtrend support. If it drops to ~$41, it will fill its earnings-fueled gap up from one year ago. While this would represent a decline of over 5% from current levels, it should bring in some buyers -- at least for a bounce.